ST. LAURENT, Quebec — McKesson Canada has agreed to purchase 380-store suburban Montreal-based Uniprix. Terms of the deal, which will lift McKesson Canada’s store count over the 2,500 mark, were not disclosed. The acquisition is a natural step for two companies with deep roots in Quebec that have a long history of working together to deliver care to patients across the province. As part of the deal, Uniprix’s individual pharmacies will remain independently owned. Uniprix CEO Philippe Duval and McKesson Canada president Paula Keays at the acquisition announcement. 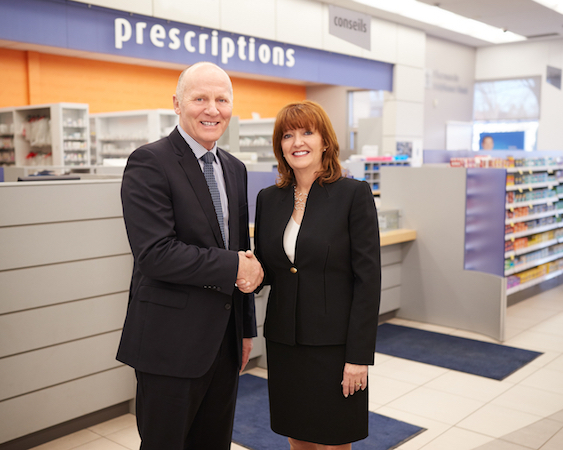 “Our two companies are coming together to help build the future of Uniprix’s independent pharmacists,” said McKesson Canada president Paula ­Keays. “The acquisition will allow independent pharmacies to remain competitive in an increasingly changing industry. Uniprix, headquartered in St. Leonard, has been developing a new store concept dubbed “the pharmacy of tomorrow” focusing on health, prevention and well-being. The acquisition, which must be approved by shareholders and the Competition Bureau of Canada, follows McKesson Canada’s $2.2 billion (Canadian) purchase of 470-store Rexall Health from Katz Group Canada Inc. The deal was authorized by the competition bureau late last year with the proviso that McKesson Canada divest 26 Rexall outlets from Ontario to the Northwest ­Territories. The deal with Katz Group — covering Rexall/Pharma Plus pharmacies, Medicentres Canada and Claimsecure Inc. — was announced a little over 13 months ago. “McKesson and Rexall Health will continue to deliver choice and access, integrated pharmacy care, and industry-leading service levels,” said Paul Julian, executive vice president and group president at McKesson Corp.